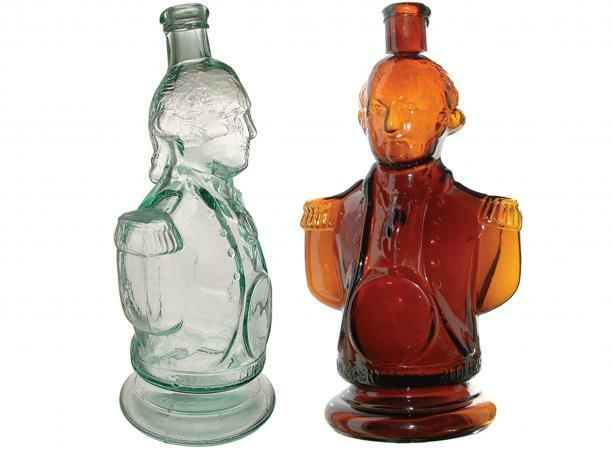 Antique George Washington bottles are highly sought after by bottle collectors in two distinct styles, figural and flask. 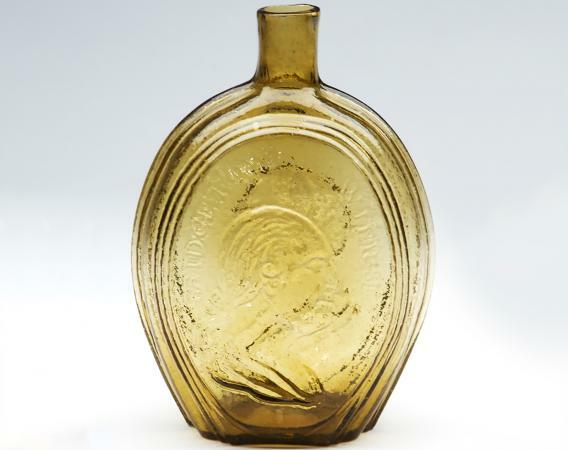 In 1875, Bernard Simon designed a figural bottle to represent an officer of the Continental Army. The military figure that was portrayed on Simon's bottle closely resembled several of Gilbert Stuart's famous portraits of George Washington. Because of this resemblance, when the bottle was introduced for sale in 1876, it was named The Bust of Washington Bottle. These figural antique George Washington bottles are known as bitters bottles. The concept of bitters had spread from Europe and was very popular in America from 1862 to 1906. In order to avoid the revenue tax on liquor, herbs were added to gin and the mixture was sold as medicine. Salesmen would advertise the bitters by telling people they would feel better with every sip of their medicine. In order for a collector to qualify a bottle as a bitters bottle, the word bitters must be embossed onto the bottle or a paper label with the word must be affixed to the bottle. On Simon's George Washington figural bottles the word bitters is clearly embossed on the pedestal. The inscription on the front reads: Simon's Centennial Bitters and the back reads: Trade Mark. 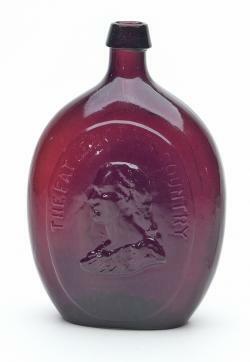 Original George Washington figural bottles were produced in several colors. The most common color is a light aqua blue, and there are also bottles in various shades of amber. The collars of the bottles, also known as lips, were produced in two styles, single collars and double collars. Serious Washington bottle collectors look for variations in the maximum 1/16th inch thickness of single collar bottles, and differences in the thicknesses and merging patterns of two collar bottles. Regardless of color or collar, each original George Washington figural bottle had a cork stopper. Although the original bottles do have a few minor differences it is believed that all of the 1876 originals were produced from several molds that were very similar. These figural bottles stand 10 1/4 inches high, and the measurement across George Washington's chest is 5 1/4 inches. They weigh approximately 22 ounces empty and hold 30 ounces of liquid. The base of the bottles vary slightly, with some perfectly round while others are slightly oval. Although the embossed letters on the bottle are very clear and crisp, George Washington's features are not sharp at all. The bottles have distinct two part mold marks and no pontil mark. One of the main ways to identify a reproduction of a George Washington figural bottle is to look at the embossing of the words. On reproductions the words are not clear, and in some cases it is almost impossible to read them. Another way to identify a reproduction piece is a pontil mark. Many times an inexperienced collector will see a pontil mark on a bottle and think it must be very old, making it an original. 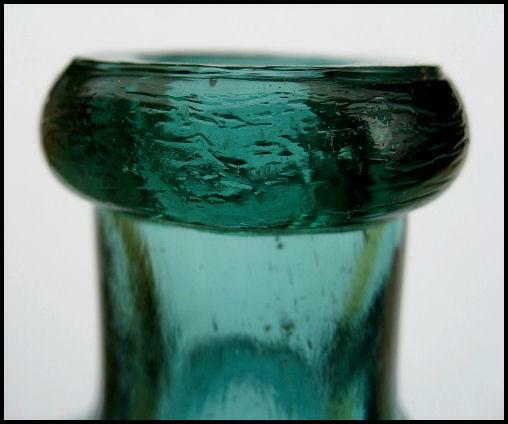 Always check the collar of the bottle to see if it has distinguishable rings. Many of the reproduction bottles have a blob top. It is also important to consider the color of the bottle. Reproductions usually are deeper and richer in color then the original bottles. Dr. Thomas W. Doytt, a self-proclaimed doctor set up a boot blackening and patent medicine business in the early 1800s. 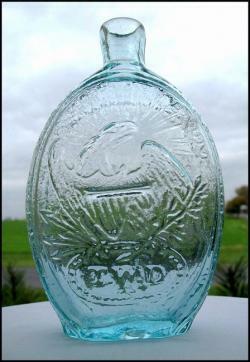 Doytt also became a part owner of the Olive Glass Works of New Jersey and affiliated with the Kensington Glass Works which is famous for producing most of the historical flasks collected today. In 1824 Doytt created a one pint flask with a bust of George Washington on the front. Washington is dressed in military uniform and embossed above him are the words General Washington in a semi circle. On the back of the bottle is an American eagle. The flasks were produced in an aquamarine or light aquamarine color. The flasks were very popular and a year later Doytt advertised that there were 3,000 dozen of the flasks for sale in an ad he published in the Philadelphia Gazette. These beautifully colored flasks are in high demand by collectors today. There is not any written record telling the number of flasks Doytt actually produced. It is known that the General Washington flask was produced for two years from 1824 until 1826, but it is unknown how many years the altered flask was produced. In today's collector's market, Firecracker Flasks, which are of great historical significance, are generally the most highly sought after antique George Washington bottles.